A stunning combination of both country and traditional exterior elements creates a timeless facade for this exquisite estate home. A dramatic two-story rotunda makes a grand first impression, followed by equally impressive dual staircases and a large great room with cathedral ceiling and overlooking curved balcony and loft. The spacious kitchen easily serves the dining room, breakfast area, and great room. Note the walk-in pantry. The media/rec. room features a wall of built-in cabinets to house television and stereo equipment. More oasis than bedroom, the master suite is amplified by a deep tray ceiling and enjoys a fireplace, built-in dressing cabinetry, his and her walk-in closets, and a luxurious bath with every amenity. 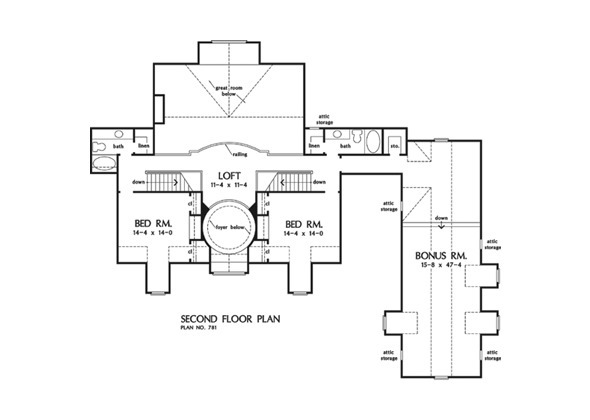 Two bedrooms, two baths, and an oversized bonus room are on the second floor. 2nd Floor: 1080 Sq. Ft.
1st Floor: 3732 Sq. Ft. Bonus Room: 903 Sq. 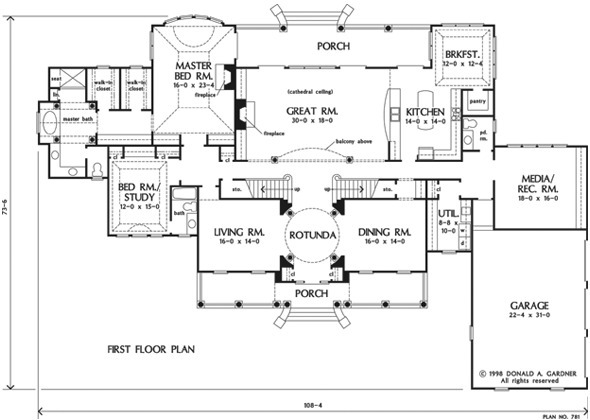 Ft.
House Dimensions: 108' 4" x 73' 6"
Great Room: 30' 0" x 18' 0"
Master Bedroom: 16' 0" x 23' 4"
Other #5 : 10' 8" x 2' 0" x 9' 0"
Dining Room : 16' 0" x 14' 0" x 9' 0"
Great Room (Vaulted): 30' 0" x 18' 0" x 19' 1"
Kitchen : 14' 0" x 14' 0" x 9' 0"
Breakfast Room (Tray): 12' 0" x 12' 4" x 10' 5"
Utility Room : 8' 8" x 10' 0" x 9' 0"
Bonus Room (Vaulted): 15' 8" x 47' 4" x 10' 5"
Garage : 22' 4" x 31' 0" x 0' 0"
Master Bedroom (Tray): 16' 0" x 23' 4" x 13' 4"
Bedroom / Study (Tray): 12' 0" x 15' 0" x 10' 5"
Bedroom #3 (Clipped): 14' 4" x 14' 0" x 9' 0"
Bedroom #4 (Clipped): 14' 4" x 14' 0" x 9' 0"
Porch - Front : 45' 4" x 7' 0" x 0' 0"
Porch - Rear : 38' 4" x 8' 4" x 0' 0"
Media Room : 18' 0" x 16' 0" x 9' 0"
Living Room : 16' 0" x 14' 0" x 9' 0"
Storage (Other) : 9' 0" x 3' 6" x 0' 0"
Storage (1st Fl.) : 10' 8" x 3' 6" x 0' 0"
Other : 5' 2" x 2' 0" x 9' 0"
Other #2 : 2' 4" x 4' 8" x 9' 0"
Other #3 : 6' 0" x 2' 0" x 9' 0"
Other #4 : 2' 0" x 3' 6" x 9' 0"